this one. Untitled, 1991, Site #21: 504 W 44th St.
One of the formative artworks in my life is set to re-appear this month. 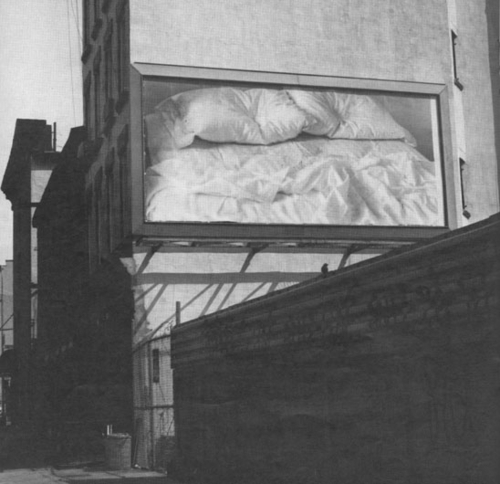 I saw one of the giant black & white billboards of the Felix Gonzalez-Torres’ empty bed in the city in 1992 before I realized it was part of MoMA’s Projects series. Billboards were supposed to promote something, to give you information, I thought, not to leave you wondering. Wondering what the hell is being sold here, what something as private and messy as a bed is doing on a billboard. Rather than clipping something from the mass media and repositioning it within the clean smooth space of a work of art, he makes the photograph of the bed the informational fragment, and collages it into the broad and varied pattern of the contemporary urban landscape. The artist has explained that by “taking a little bit of information and displaying this information in absolutely ironic and illogical meetings,” he hopes to reveal the real meaning of issues. The juxtaposition of an image that we are inclined to read as private and a space usually conceived of as public is what Gonzalez-Torres would describe as an “illogical meeting.” When we call something illogical, we are essentially saying that it runs counter to our expectations. [Kosuth:] …there were very few people who wanted to spend their money without getting some ‘goods’, you know. FGT: Well, you opened the way for other artists. People can buy these billboards, but they have to put them in public–they have to rent a public space. It’s like buying edition prints, except that you have to put them up on billboards. It’s also doing a service to the collectors because they don’t have to put the works into storage! Never mind that fabrication and the monthly cost of renting adspace far outstrips any storage cost. I think Felix’s point with his billboards was that he was fine delivering collectors the “goods”; but to see the goods, they have to print them up and install them in public. For every Felix billboard, the owner gets an image, a certificate, and the right to fabricate and install it in public any time. But for one billboard, Untitled (for Parkett) [above], Felix created his own “illogical meeting,” a work which thwarts the very expectations he set up for the rest of his work. Felix created Untitled (for Parkett), in 1994 for, as the parenthetical says, Parkett’s editions series. 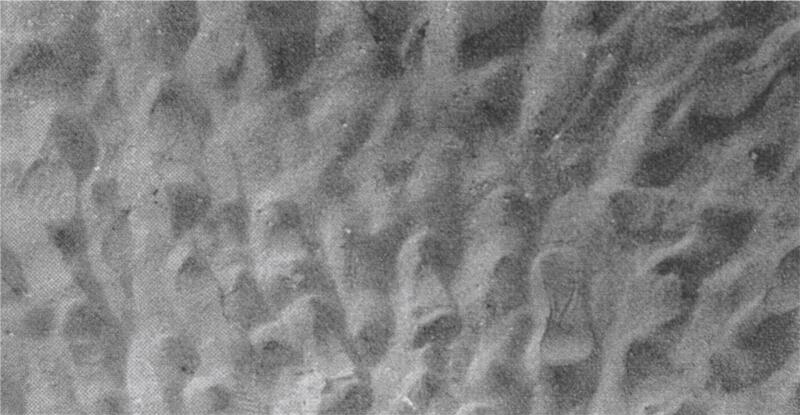 The abstraction-like image is a black & white photo of sand churned up by footprints. It was published in an “edition of 84, 15 a.p., several exhibition copies,” and produced the same way as his other billboards are [or were, anyway], as giant silk screened sheets of Appleton coated paper that get tiled and pasted up like wallpaper. This piece is not complete until installed. The installation site will be its permanent location until the piece is destroyed. But the Phillips language struck a chord in a new way. In 2007, Christie’s explained the piece a little harshly: “This work should be displayed in only one location; removal will destroy the piece.” But that’s easy, just never remove it. And anyway, that’s after it’s installed, in some distant unimaginable future. Phillips, though, pointed out the weird anomaly of Untitled (for Parkett), which is that the work, as it exists, as it’s being sold, as I have it, in fact, is incomplete. Suddenly, I’m not a steward preserving the work; I’m an obstacle impeding its realization. And so is everyone else who bought the work, only to keep it rolled up. The people who hold it in stasis, retarding its potential, and keeping it viable and exchangeable in the marketplace. According to the publisher, Untitled (For Parkett) employs the materials of industrial advertising which are not meant to last indefinately [sic]. The Billboard is not water-proof. Marks and imperfections in the printing are a natural result of the printing process and are part of the image. Bubbles or wrinkles remaining in the paper after installation are an expected and acceptable part of the finished work. The billboard is designed to be installed either indoors or outdoors. Like most of the artist’s works installation is an integral conceptual part of the work, and is considered incomplete until then. Not only are you depriving the work of its destiny by not installing it, it’s not going to last anyway.